On Tuesday, I had the opportunity to lead the Reel Time TV crew from FL Sportsman offshore to target sailfish. It was an epic day for us. There's just a little pressure when an entire production is counting on you to find the fish. :grin Plus, being a female it was really important for me to show that I could pull this off like any other co-hosts they've had on the boat before from catching the bait to working the kites and fighting the fish. We spent a day inshore in the Gulf and a day offshore. I cannot give all of the details away but I can tell you that you will want to make sure to watch this episode in about 7-8 weeks. It was an action packed day! They select the next location based on fishing reports in the forum and I am so excited to have been their first female co-host. Here is a sneak peek of the sail I caught with the show's host, George preparing for the release. This sailfish was so lit up, she was beautiful. What was great about the show too was that they kept the sail in the water the entire release. It's so important to the survival of the fish to keep it in the water at all times. 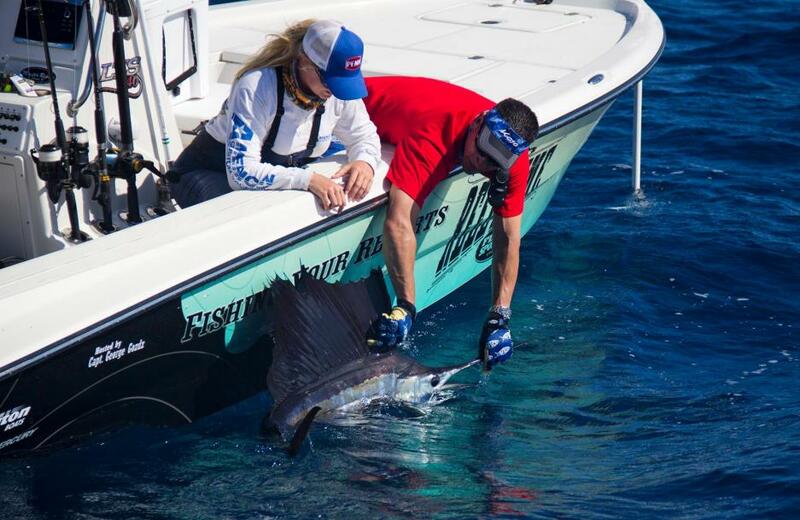 I documented the release with the Billfish Foundation on their website and this will be my 6th release marked with them in 2014. "Advancing the sport of women in the fishing industry through education to become better anglers and conservationists." Very nice. Will be a good show. We also had a great 3 days of fishing down there this week. It's so important to the survival of the fish to keep it in the water at all times. so many people don't relies this and yank the fish out of the water to get a picture with it. I agree with you, I never take a sail out of the water. Very nice !! looking forward to it. "You never know unless you go"
Excited for the show. That's a great release picture with that sail. Nice job! That is great to hear. Great pics! The wife and I enjoy that show and will look forward to seeing yours! Looking forward to it. I haven't seen other serious woman captains other than my wife, so that will be refreshing. Maybe there are more in FL, but in MD/VA it is *very* unusual. My wife runs our Triton 240 LTS (just like the one used in the RTFS series). She hauls it 1200 miles to the Keys with her F450 pickup (which she also hauls horse trailers with), and runs the boat including trolling motor, etc.. She is a very good fisherperson - she used to fish bass tournaments and can pick up patterns very quickly - by maybe the 2nd or 3rd fish she knows what they are doing. We get some strange looks with the stereotype role reversal but after I got over the bruised ego, I found that it's a good deal for me as leaves me free to fish. I'm the mate and navigator and I do more research on species, seasons, and bait / tackle so together we make a good team. Great, looking forward to seeing the show! I see that Conch hanging out in the background. Nice report and nice job. 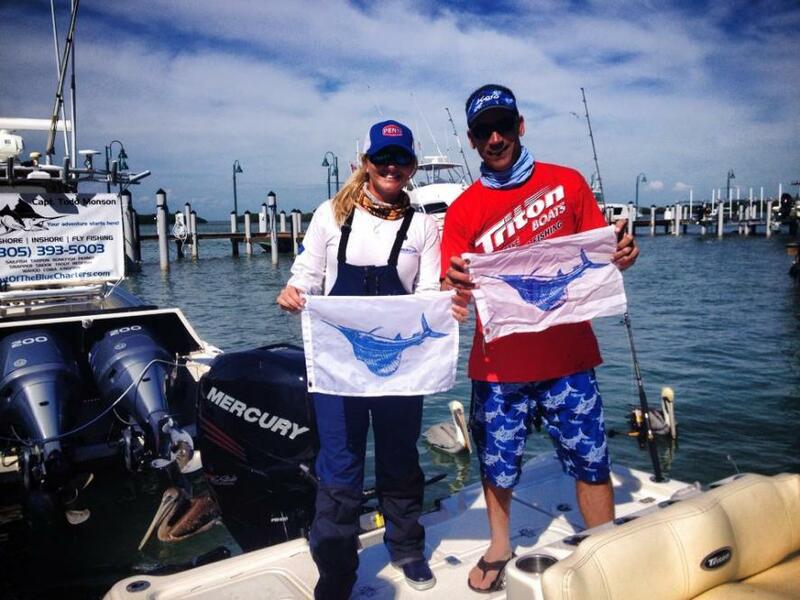 I couldn't say enough good things about my experience filming with Brittany (aka.SaltwaterSportswoman). Despite tough conditions on day one Brittany remained positive and confident in her skills. We wrecked em' on day two and I am super excited for everyone to see Brittany at her best. Thanks again for a great time! Host "Reel Time with Florida Sportsman"
Best show on in my opinion right now. Watched the old swordfish fish one from last season. Keeps getting better every year. Need to bring back E-Money for another high-speed hoo chase.